Public events (within the limit of available seats), moderated, in English, approx. 2h. Please register here. Events supported by a mobility project of the Romanian National Authority for Scientific Research and Innovation, CNCS - UEFISCDI, project number PN-III-P1-1.1 MCT-2016-0026. Public event (within the limit of available seats), moderated, in English, approx. 2h. Complimentary tea available for all participants. 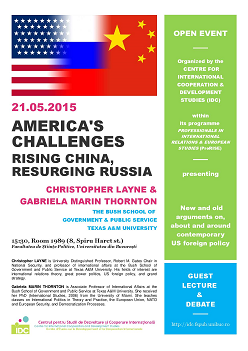 Christopher LAYNE is University Distinguished Professor, Robert M. Gates Chair in National Security, and professor of international affairs at the Bush School of Government and Public Service at Texas A&M University. His fields of interest are international relations theory, great power politics, US foreign policy, and grand strategy. Gabriela MARIN THORNTON is Associate Professor of International Affairs at the Bush School of Government and Public Service at Texas A&M University. She received her PhD (International Studies, 2006) from the University of Miami. She teaches classes on International Politics in Theory and Practice, the European Union, NATO and European Security, and Democratization Processes. The event is organized within the Professionals in International Relations and European Studies (ProRISE) programme of the Centre for International Cooperation and Development Studies (IDC). 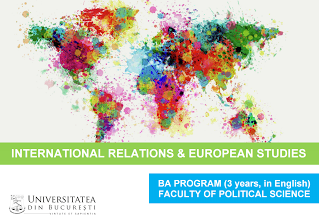 The event is also part of the annual Festival of Political Arts and Sciences - Polimateca, organized by the Faculty of Political Science at the University of Bucharest (FSPUB) to celebrate and promote political science as a discipline central for open societies. Complimentary tea available for all participants. Kwei-Bo HUANG is founding Director of the Centre for Foreign Policy Studies at the College of International Affairs - National Cheng Chi University, and Secretary-General of the Association of Foreign Relations (AFR), ROC Taiwan. After having received his PhD in Government and Politics at the University of Maryland, he held various academic positions at home and abroad, including a Fulbright Visiting scholarship at the Johns Hopkins University and Visiting Fellowship at the Center for Northeast Asian Policy Studies, Brookings Institution, Washington. He also served as Vice President of the Taiwan Foundation for Democracy (2009-2011) and as Chairman of the Research and Planning Committee at the ROC Ministry of Foreign Affairs (2009-2011). His research interests include international conflict management, US foreign policy and decision towards the Asia Pacific region, international political and military relations of Southeast Asia, and public diplomacy. Public event (within the limit of available seats), moderated, in English, approx. 3h (with 2 short breaks). Complimentary tea available for all participants. Luís DE SOUSA (Ph.D., European University Institute) is Professor at Aveiro University, Portugal, and founding member of the Centre for International Cooperation and Development Studies (IDC). He is also co-editor of EPS: European Political Science, an ECPR journal published by Palgrave Macmillan. He is coordinator of ANCORAGE-NET, a research network on anticorruption agencies (www.ancorage-net.org) and Chairman of Transparência e Integridade, Associação Cívica (TIAC) - Transparency International’s contact point for Portugal. He is also Local Research Correspondent on Corruption for the European Commission and acts as a consultant to various international governmental and non-governmental organizations on corruption control and political financing issues. Among others he was a former Edmond J. Safra Network Fellow at Harvard University and an international scholar within the Academic Fellowship Program of the Open Society Institute. His current research interests focus on corruption and corruption control studies, the politics of ethics reforms, regional integration (institutions and policies), cross-border relations, international organizations and comparative politics in general.